What do we mean when we talk about story structure? A story is a complex entity comprising many interrelating parts. The author imposes some sort of organising principle onto the material, turning the story into a narrative. The result of this forming or shaping of the material is the story structure. Certain structural markers are so explicit that the audience is aware of them, such as chapters in novels. Elizabethan plays are typically divided into five acts. A film script is broken down into acts, sequences, and scenes. The beat is the smallest unit of story, below the scene in the structural hierarchy. It is the space between an action and the reaction it causes within a scene. A plot event is not part of this traditional hierarchy, being more of a meta-unit somewhere between beat and scene. Scenes and acts are defined in screenplays, like chapters in novels. But stories have structures that are not usually made obvious or explicit. There are two different understandings of the term beat. A scene may be broken down into beats ­– marked only by the moments when the mood or relationship the scene describes changes. Two characters are having a conversation, character A says something which makes character B react in a different way from what A expected – that’s a beat. The term motif refers to any recurring element – in storytelling as in music or other arts. Examples of elements that turn up repeatedly within a whole are an image on a tapestry or a particular sequence of notes in a symphony. The dispersal of these elements creates a pattern. It is therefore part of the artist’s craft to have some sort of design principle determine this pattern. Motifs do not make a plot. But since they make patterns they are part of the structure of a story. And they help add a layer of meaning. In other words, if a motif is present excessively in the first half of a story, and hardly at all in the second, then the author had better be aware of a reason for this uneven distribution. The distribution – the pattern – carries meaning to the audience. Remember, the audience yearns for meaning, is always striving to understand what the story is trying to convey at any given point. This demand for some sort of raison d’être for each element of a story, or for a sense of order within the whole, may well be unconscious to the audience much of the time, but ultimately the experience of the story is more satisfying when the audience can work out reasons and meaning. In stories, motifs can be almost anything. Objects, actions, metaphors, symbols, colours, or images can be motifs. What defines an element as a motif is the systematic deployment within the story rather than the thing itself. How to describe a full plot event. We’ll talk here about describing events, since the usual term scene is more general and has different meanings for different media. Furthermore, a scene may conceivably contain more or less than one entire event. An event in a story requires three elements: characters, function, and (perhaps most importantly) a difference between expectation and result. In describing each plot event, it is useful to consider the six wh- questions as a guide: Who does what to whom, where, when and why? 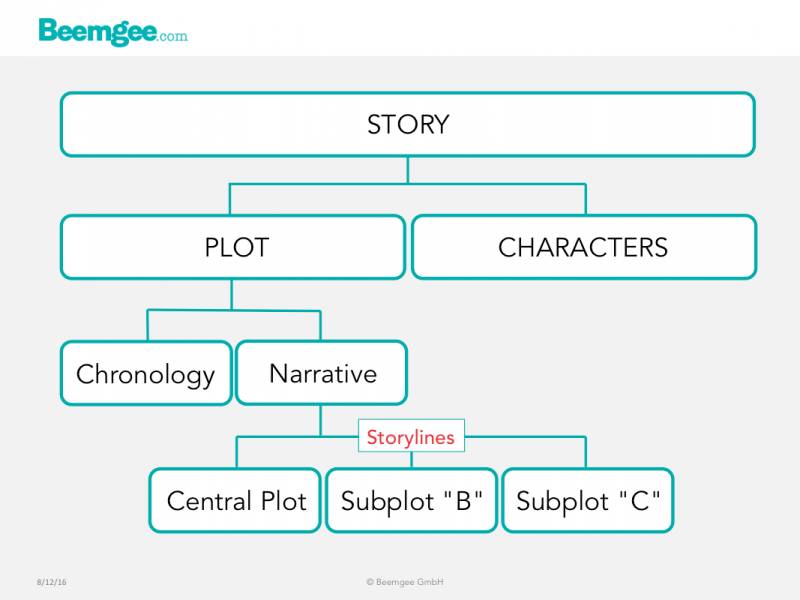 With this approach, each plot event gains its own logline, which is a good exercise since it forces you as an author to figure out just what dramatic function each plot event has in the context of the overall narrative. Inventing a story that has no backstory is about as easy as finding a perfect rhyme for the word orange. That is, next to impossible. Backstory is the stuff that went on before the story begins, or more precisely, before the kick-off event in scene 1. As such, backstory might better be called “pre-story”. It is a necessary component of any story. Narrative consists of successive events. One recognizable convention from film is what we might call the kick-off event. It is the opening scene, the very first item in the narrative. This is not to be confused with the inciting incident. We’ll refer to the kick-off event as the initial scene, and whatever the medium – page, stage, or screen – it ought to capture the audience’s or reader’s attention.